Deciding on a new stylish look for your home? We're taking a look at Dune's new Minimal Chic collection which has been based on the minimalist artistic movement. The designs have balanced simplicity and shape to create personality and soft tones as well as using geometry as a central axis. Each collection has been inspired by an artist and the work has been created on a tile instead of a canvas. The light and dark colours bring a bright and textured look to the tiles. This collection is composed of 2 series, Emporio which is a marbling finish and Factory which is a cement finish. Sizes vary from 20x20 decorations to 30x60 wall tiles and 60x60 to 60x120 floor tiles. This beautiful product is inspired by artist, Agnes Bernice Martin who created iconic geometric abstract paintings. This decoration features different tones, with a mixture of a stony and cement finish to give your home a bright look. Inspired by artist, Nicholas Brice Marden who frequently explored multi-panelled works that showcased a wide range of colours. This gorgeous product is a distinctive decoration that shows the changes and wear of the stone due to the application of crackle granilla. The different tones reveal a monochrome background, which could work well in the kitchen or dining room of your home. The horizontal and vertical parallel lines in this tile are inspired by artist Dan Flavin who focused on lights, installations and sculptural works. 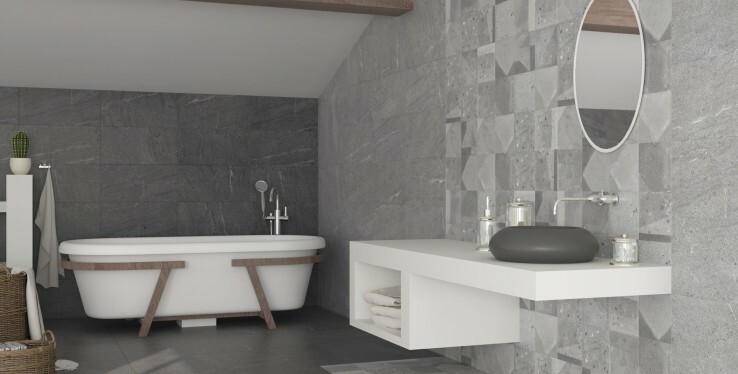 The product comes in two gorgeous finishes one with beige tones on the Fumo tile and the other with grey tones on the Ferro tile. The design provides texture not just from the feel, but also the look. This colourful and patterned tile is inspired by artist Frank Philip Stella who incorporated different elements, techniques and materials to create complicated work. This product is a set of hydraulic designs, which uses pastel and different shapes. It's a stylish tile that can bring plenty of life to your home with its patterns. This tile is full of rich decoration, it is based on artist Daniel Buren's work who used vertical stripes throughout his pieces. This tile features patterns that make a statement in any room, with the repetition of shapes brings detail and multi-coloured terrazzo fragments. To find out more about the Minimal Chic range, head down to our Cheadle showroom or give us a call on 0161 485 1373!